I was also getting puffs of smoke from the breather under the clutch housing but only when the car was in the over run., The seal between the gearbox and clutch was perfect with no signs whatsoever of the leakage of oil. I am certain it came from the engine side of the flywheel. In spite of all this the clutch didn't start slipping until the road speed exceeded 35 mph. When the pistons were taken out all the rings just fell apart, not one was complete and they were all broken in small parts but amazingly the engine still ran - tough little blighters these Austin engines. Thanks for all your help and advice everyone. I agree with Michael and disagree with Peter; the oil mist does not 'disappear' when the engine is hot or get 'thrown off', it coats and lubricates many parts of the internals - valve guides, tappets, skew gears for the oil pump and distributor etc. - and the clutch! From my experience, this can happen to relatively new engines as well as poorly ones. Make sure you use the heavier clutch springs that were designed and manufactured by the Club - not sure if they are still supplied? Looks like it self converted to a fluid flywheel! This photo shows how bad it was after removing the flywheel assy. Not surprising the plates were fouled..
Oil leaks from the engine leak on to the back of the flywheel and get thrown off by centrifugal force and drip out of the hole in the bottom of the bell housing. 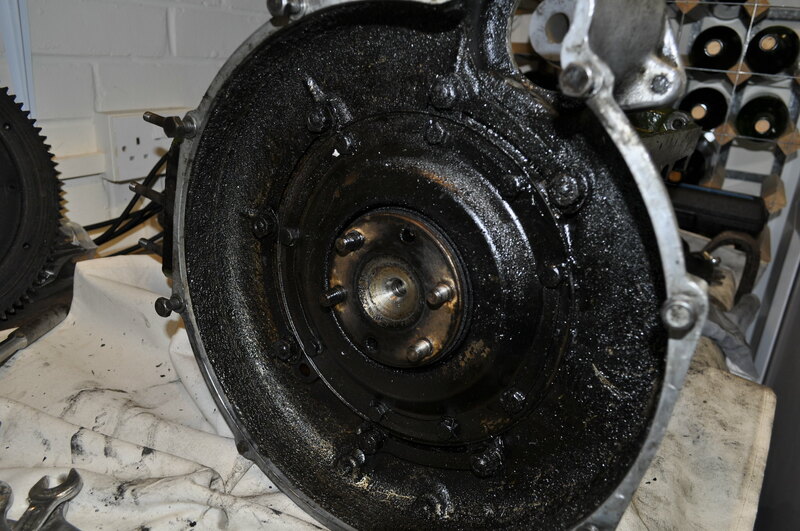 Oil on the clutch linings is almost always caused by leaks from the front of the gearbox. You are correct in arriving at the cause for oil reaching the clutch. I had the same problem with my engine through wear in the bores and the rings sticking because the van was laid up for many years during WW2 and after and as far as I'm aware the previous purchasers did nothing to the van resulting in excessive oil consumption and a slipping clutch. The use of SAE 30 oil is not the cause - this is the recommended grade for winter use - SAE 40 for summer. Follow the good advice of Mike's post and you should have a good result. Mine did exactly the same when I had a little end pinch bolt fail and the gudgeon pin scored the bore allowing pressure past the rings and out through the bell housing. If all your mechanics are sorted including the felt seals when you reassemble, and you clean everything before reassembly the oil thrower will work fine. Before the engine on my A10 failed completely with a broken piston it appears that increased pressure in the sump caused by the oil being pressurized by exhaust gas escaping though a broken ring forced oil through the oil thrower plate at the end of the crank shaft and into the clutch housing - unless someone would like to dispute my theory with another possible cause. Having reached the stage of rebuilding the engine is there any way the seal caused by the oil thrower ring/ plate where the crankshaft passes through the engine casting may be improved so I can reduce the possibility of oil reaching the new clutch plate. Incidentally I have never overfilled the engine oil or used anything other than a 30 SAE single grade oil which was another suggestion made for the presence of oil on the clutch plate.